Earlobes form an integral part of facial aesthetics and are considered an important part of the facial appearance. 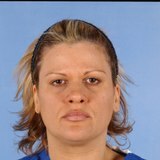 They offer significant characteristic features that could cause concern if they are asymmetrical or too large. In this article, I will discuss the relevant anatomy that must be considered and will examine common conditions that can affect the earlobe. 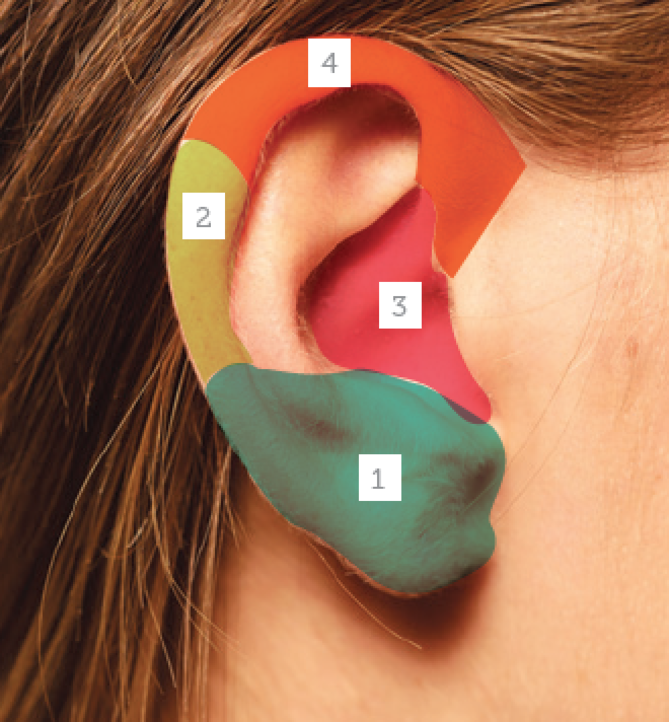 Understanding external ear anatomy is vital in treating the earlobe (Figure 1).2 The external ear comprises the auricle, or pinna, and the ear canal. 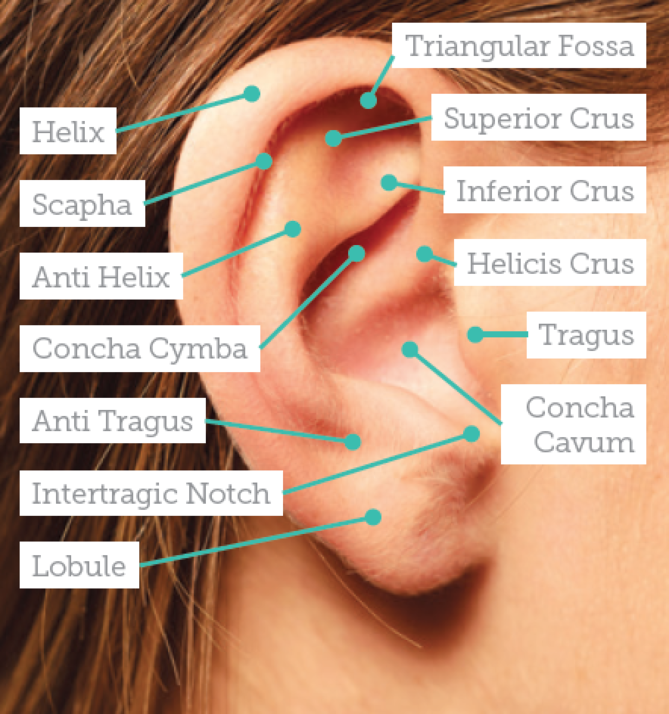 The auricle (visible part of ear) is composed mainly of cartilage covered by skin and consists of the helix, antihelix, lobule, tragus, and concha. The human earlobe (lobulus auriculae) is composed of tough areolar and adipose connective tissues, lacking the firmness and elasticity of the rest of the auricle. There are mainly two types of earlobes; one where the lower lobe is connected to the side of cheek and another where the lower lobe is free from the side of cheek. 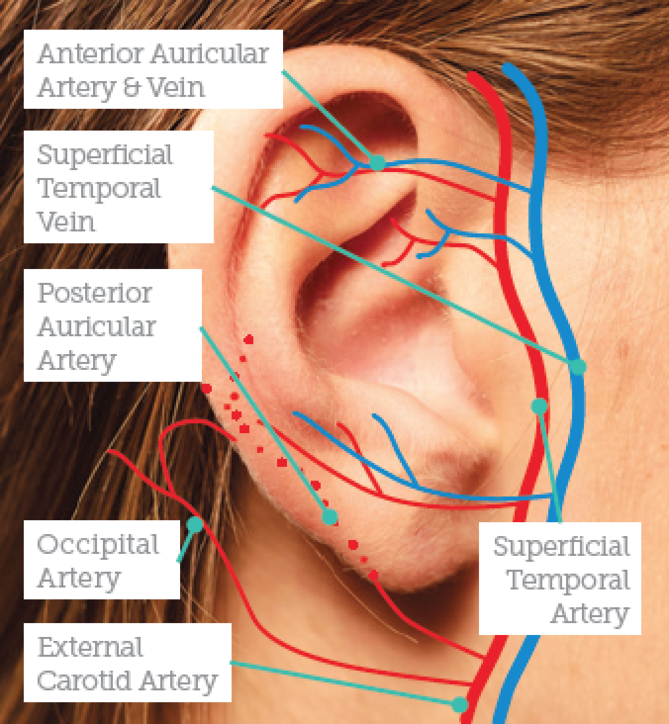 The earlobe has a large blood supply to help with warming the ear and maintaining balance.2 The blood vessels and nervous systems must be considered while treating a patient and good anatomical knowledge of this area is critical. The external carotid artery consists of three branches that supply blood to the ear. These are the occipital artery, posterior auricular artery and the anterior auricular branch of superficial temporal artery.2 The veins run together with each artery, as illustrated in Figure 2. Having knowledge of the blood supply helps the practitioner to ensure that the flap will continue to have blood supply when cutting the earlobe. Ear piercings and wearing earrings are known to cause trauma to the ear, some of which include split earlobe, an enlarged ear piercing hole and keloid scarring. Split earlobe, commonly caused by wearing large and heavy earrings that are suspended from a fine ring, will gradually cut through the earlobe. Going to bed without removing heavy earrings can also cause split earlobe, as the earring puts weight on the earlobe through minor pulling on the earrings that occurs as the head rubs and moves on the pillow. Catching earrings whilst combing hair can also cause trauma. 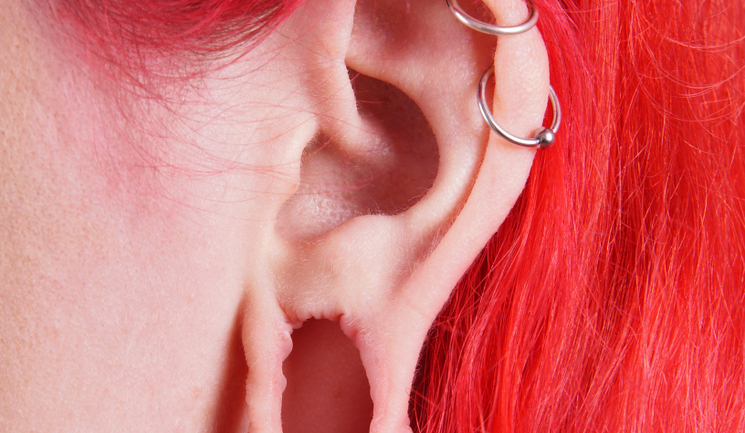 The traumatic split earlobe can be divided into two categories: complete and incomplete, where the hole from which the piercing has been made is either slightly torn or completely torn. A variety of techniques to repair split earlobes can be applied with or without reconstructing the piercing’s hole.5,6 I prefer to repair without reconstructing the hole and advise patients to wait to re-pierce the ear six months later, at either about 2mm medial or lateral to the scar to prevent the risk of the recurrent of the split. In general the technique of split earlobe repair falls into two categories, a straight line or a broken line of repair. The straight line repair is simple but, aesthetically, the final result might be unacceptable as the scar contracts and a notch at the free border will appear. The straight line can be avoided either by using a broken line of repair technique such as a Z-plasty7 (also known as the lab-joint technique6 or by L-plasty,8,9 which is my preferred technique). 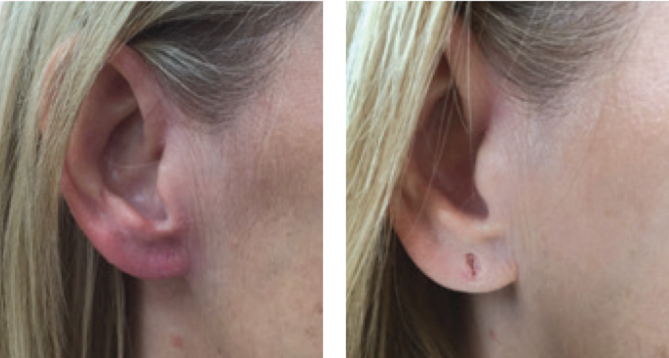 Z-plasty is a technique that leaves the wound in a Z-shape to prevent the risk of the scar shrinking and causing a notch effect on the free border of the treated earlobe. For incomplete split earlobe repair, the L-plasty is recommended, rather than cutting skin around the edge of the split and stitching. Doing so may cause elongation of the earlobe, which is an unacceptable shape for some patients. I have developed a method to remove earlobe tissue without leaving a notch or scar on the free border by excising the earlobe, as depicted in Figure 6. Firstly, the practitioner should discuss with the patient how big of an earlobe they prefer and draw it with the white marker, as per the left image. Draw the line from the tragus to the white mark level (as shown in the middle image) and the second line on the earlobe from the tragus to the lateral end of the white mark. Measure the length of both lines, create a triangle and draw on the second line as illustrated, whilst making sure the size of the triangle base is the same as the length of the first and second line, as this triangle cut will help reduce the length of the second line to the same as the first line. Excise the earlobe as marked, then stitch the triangle in first to shorten the second line, before joining the first and second line with deep dermal and vertical mattress stitches. My preferred treatment is the Y-plasty10 for a very large ear piercing hole, L-plasty for a large piercing hole, depending on the amount of earlobe tissue available, and elliptical excision for very small ear piercing holes. For L-plasty, it’s essential that the lines of excision are drawn on the highest point of either side of the cleft before the edges start curving in gently, as failure to do so will invariably lead to leaving a groove along the repair line giving the impression of split earlobe with a notched border. Inject local anaesthetic (2% xylocaine with epinephrine or 2% lidocaine) at the junction of the earlobe and cheek superficially at the sub-dermal layer (to prevent the risk of facial nerve injury) at the front and back of the junction, from the lowest end of the junction up to the intertragic notch, about 2ml. Alternatively, infiltrate the earlobe with the anaesthetic solution (without epinephrine) until it becomes firm and pale; this will make the excision using a scalpel easier but it might be difficult if using Iris scissors. For the L-plasty and Y-plasty techniques, the areas are excised as per the desired marking, starting from the free border to the apex of the cleft of the earlobe, using an Iris scissor or scalpel. It’s important to check that the back side of the earlobe has been cut to the same shape as the front. The flap is then inserted accurately, starting from the anterior aspect, and any discrepancy that may arise is transferred to the posterior aspect, making sure that there is no irregularity in the free border of the earlobe. When cutting the earlobe, ensure that the earlobe is cut through properly in the desired shape by checking the back side of the earlobe before you start stitching the wound. Ensure all stitches are tightened properly, otherwise the patient may experience bleeding post procedure and/or the wound may not close properly. Stitches can loosen from stress or pressure applied on the area. Advise the patient to avoid any stress on the area by sleeping on their back and avoiding contact sports or any activity that may cause pulling of the ear. Ensure the shape of the earlobes are similar both sides by measuring the marking on both earlobes and establishing that they have the same angle and length, by sitting the patient up to check. Advise patients prior to the procedure that there is a chance that the earlobes may not look exactly the same, dependent on the tissue available. In case of earlobe reduction, measurement of the marking on the earlobe must be done to ensure similar results for both earlobes. Bleeding, bruising and haematoma may occur, ensure all stitches are tightened properly. Advise patients to avoid taking blood-thinning substances such as alcohol, aspirin, ibuprofen and vitamin C and E prior the procedures. Triamcinolone (TCN) could cause an anaphylactic reaction, which is a type 1 anaphylactic reaction, mainly caused by Immunoglobulin E (IgE) antibodies. The allergens in TCN can not only be steroid itself, but can also be carboxymethyl cellulose (CMC)14 and succinate in liquid used in the solution.16 Ensure a medical history of the patient’s allergic reaction occurrence is taken, particularly their history of allergic reaction to steroids. 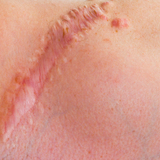 Scarring can occur in skin types V-VI patients. Any patients who have a history of keloid or hypertrophic scars should be advised that the risk of keloid scarring could occur. If an infection occurs, advise patients to avoid touching and contacting the affected area with water for at least the first two to three days after the infection presents. Patients should wash their hair in the morning of surgery and avoid washing their hair for two to three days after. There is a variety of earlobe repair treatments and many factors involved in choosing the right technique for each individual case. Split earlobe repair with the L-plasty technique, and earlobe reduction and large piercing hole repair with the Y-plasty technique, can provide excellent results with minimal risk of complications. Pitts V, ‘In the Flesh: The Cultural Politics of Body Modification’, 2003.